Find out what this new technology is all about! 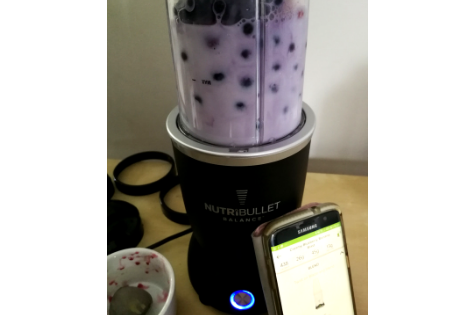 The NutriBullet Balance Bluetooth Enabled Smart Blender is probably one of the smartest kitchen gadgets you could ever have! I personally would never have imagined being able to sync my blender with a phone. For anyone who’s working their way into creating a true smart home, hassle-free and healthy lifestyle, this should be on your to-buy list. The blender is quite compact and it only takes up a bit of space in your kitchen. All the pieces to this smart blender are made very well and feel durable. You won’t have to worry about putting together a complicated machine because all the parts are big and easy to assemble. With its size, I don’t have to worry so much about it toppling over by accident and it makes it very easy to clean as well. I can get my hand in there and wash it well with soap and water without worrying about how food particles will get stuck inside and create mould. All in all, it’s best to consider the space you have in your kitchen when buying this strong blender. The power base is equipped with suction legs that help you secure the blender to the counter, making it effortlessly stable. You won’t have to hold it down to keep it from falling over! 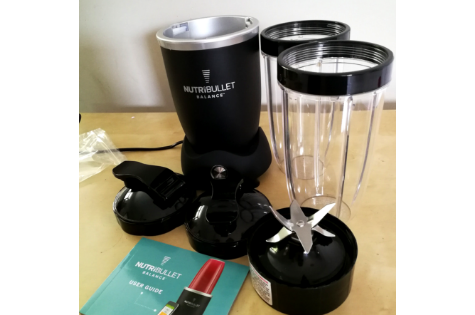 At 1200 watts with an impressive extractor blade, the NutriBullet Balance doesn’t leave any chunks in your smoothie and they come out perfectly blended. It even stops blending on its own which means you won’t have to worry about checking on it to make sure it’s not overheating. It also doesn’t need any rubber rings like in conventional blenders which accumulate food particles and can get mouldy when not washed properly. 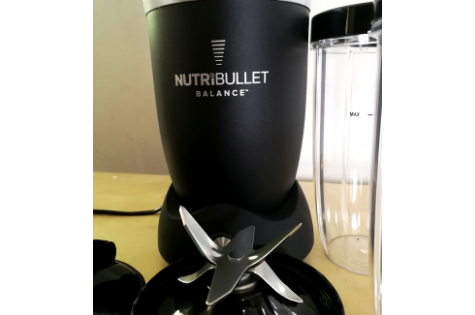 Even with the absence of rubber rings, the NutriBullet Balance doesn’t leak at all! Although the cups come at a colossal 32oz size, it’s great to have whether you’re living alone or with a family. With two 32oz cups, you can make enough smoothies for your whole family or just use one cup and save half of that smoothie for later. Storing and sharing is made easier with the flip top lids that come with it. What sets this apart from the previous model is how it can be connected to an app on your phone via Bluetooth! 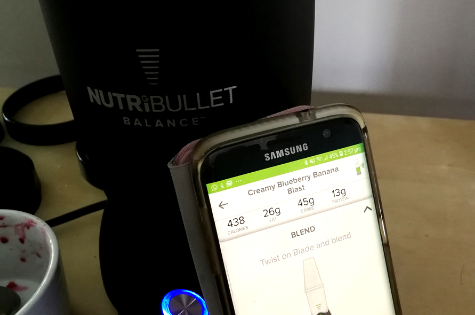 The smart sensor scale in the NutriBullet Balance sends the nutritional information to your phone in real time for all the ingredients you add. I can now personalize my smoothie creations that can suit my family’s needs. This is perfect for health buffs who count calories, nutrients and monitor sugar intake. It contains all the information you need all in one place! This is also helpful for families who have allergies or are following a specific kind of diet (like paleo, low-carb, dairy-free) because you can put all that information in the app and it will suggest the best smoothies you can make. And since it’s linked to an app, all the smoothies I make come out tasting great because the ingredients are put together with accuracy. The cool thing about the app is that it also allows you to share your own recipes for other app users to see and try for themselves, too! I finally don’t have to look around for recipes in books or on the internet because they all pop up on my phone. There are no ads and no added books or print-outs to put up on my shelf. You can even make dressings, sauces, soups, marinades and desserts using your NutriBullet Balance with the help of recipes you can find on the app! Although the blender costs a pretty penny with the addition of the app, it’s still a pretty cool gadget to own if you’re going all the way with a healthy lifestyle. The app can get a little tricky when it comes to syncing it, but you will always have the option to not use the app. 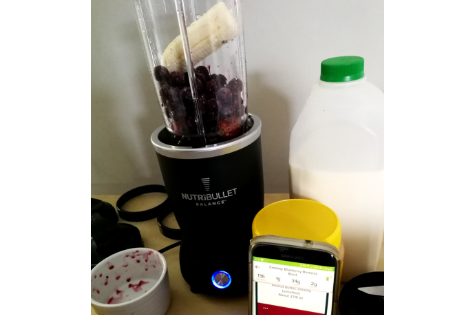 There may be times when the NutriBullet Balance app would tell you that you have to redo the smoothie even when you’ve already put the ingredients in. Overall, I love it and would recommend having this blender! It’s certainly something to look forward to using during the summer or after a nice workout at the gym.